"[Yulia] grooves as if she were a dual-native, balancing somewhere between Armenia and Argentina." 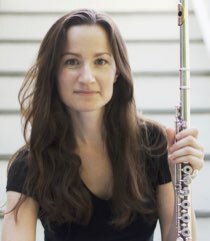 Yulia Musayelyan is a flutist and composer originally from Moscow, Russia, now based in Boston. A versatile multi-genre performer, she leads a quartet, 'Tango meets Jazz' project, and Macayú Trio, and performs with MOZIK, Fernando Huergo Quintet, Manhattan Camerata, Brooklyn Orchestra, and Marta Gomez Group, among others. She graduated from Manhattan School of Music and New York University with BM and MA degrees in performance and composition. A recipient of the 2001 NFAA Award, Yulia was a soloist with the TACTUS Contemporary Ensemble with guest conductor maestro Pierre Boulez in 2005. Her chamber compositions have been premiered at Symphony Space in New York City and featured in the 2006 film Natalie Bonn. Yulia's jazz compositions combine modern jazz harmonies, mixed meters, and improvisation with folkloric styles from Argentina, Armenia, Russia, and Brasil. The result is a colorful and distinct group sound that seeks to bridge distant traditions. She has recorded over 25 albums as a sideman, and released her debut album, Caminos, in 2009. The Armenian Mirror-Spectator writes, "[Yulia] grooves as if she were a dual-native, balancing somewhere between Armenia and Argentina." As a flutist and improviser, she has performed at the 2001 Montreux Jazz off-Festival, Buenos Aires Jazz Festival, Córdoba International Jazz Festival, IAJE conventions in New York and New Orleans, and toured the US,UK, Europe, Central and South America with various musical projects. In TANGO meets JAZZ, Yulia teams up with a rhythm section of Boston's top jazz musicians: Maxim Lubarsky on piano, Fernando Huergo on bass, and Bertram Lehmann on drums. Together they weave a passionate jazz thread through some of the great gems of the Tango repertoire, featuring new arrangements of works by Astor Piazzolla, Hector Stamponi, Pedro Laurenz, José Dames, and others. The quartet also performs original compositions by Yulia Musayelyan and Fernando Huergo, heavily influenced by the Tango tradition.